Audits can be scary. It’s the moment of truth when your organization’s finances and processes are put under the microscope. Documents, data, and workflows are analyzed and examined, sometimes uncovering inefficiencies, rule violations, and even fraud. But with AP automation, impending audits don’t have to keep you up at night. You can be prepared and in control of your processes. Recently at the Institute of Finance & Management’s APP2P Fall Conference & Expo, I presented with Joe Zulich, manager of accounting operations at White-Rodgers, on “Using AP Automation to Keep Your Company in Compliance.” Audits are a big piece of the overall compliance process, and Joe has a lot of experience in this area – 20+ years of it at White-Rodgers, in fact. We covered a lot of ways AP automation alleviates audit pain in the session, and I wanted to share some of those thoughts here. We reference this infographic a lot, and for good reason. It’s a great illustration of how an AP department’s processes look without AP automation. As chaotic as this looks, this shows only the day-to-day processes. Imagine the frenzy once it’s audit time. Paper invoices are stored in filing cabinets, and once an invoice is pulled from storage, it almost never makes it back to the same place. Often, copies are made of invoices and it can be difficult to reliably re-file the documents, making the audit process extremely resource intensive and time consuming. In addition, there is no audit trail or digital record of who has handled documents, where they are in the process, and if/why they were transferred to an ERP system. Members of the AP team are responsible for finding and providing all of this information, on top of their daily tasks. No wonder audits are dreaded! 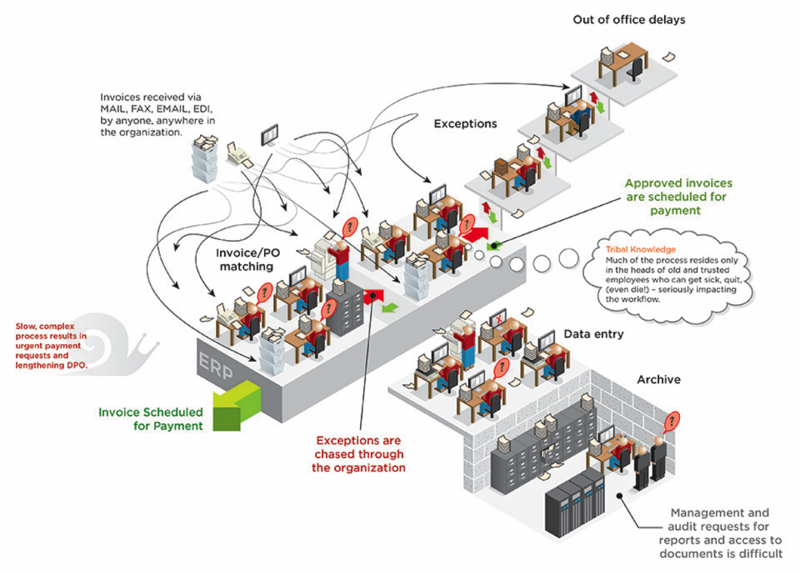 Now take a look at how automation streamlines AP processes. With AP automation, all invoices are now electronic, no matter what format they were originally in when they arrived. 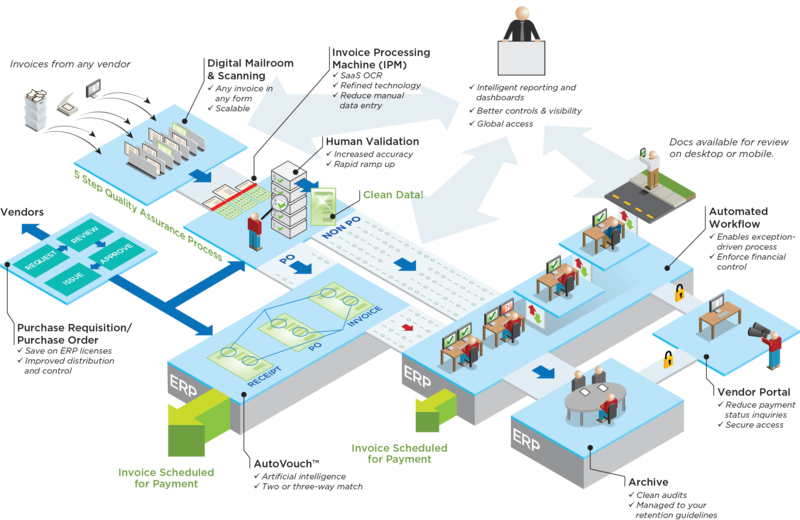 Digital Mailroom and OCR capabilities provide 99% clean data to be ingested into an ERP system. Artificial intelligence can be used to automate invoice matching and process payments with zero human touch. Workflows, controls, and approval matrices are documented and managed electronically. Documents are archived and stored according to your stated retention guidelines. Find invoices in seconds electronically; no searching through file cabinets. 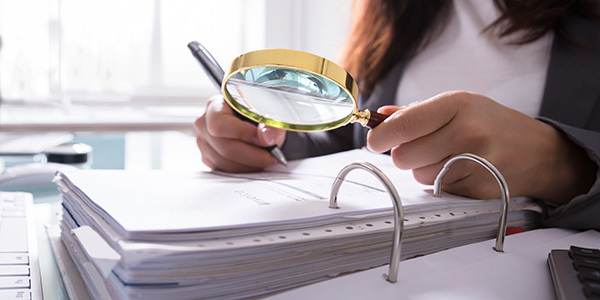 Once you take the pain out of audits, you not only free up members of your AP team to take on better, higher level tasks, but you also allow your team to take part in other types of audits that can benefit your company, like audits between business partners and sales/use tax audits. These audits can strengthen partnerships and uncover overpayments, ultimately saving your company money. Are you ready to make audits easy with AP automation? Contact us.